Your LinkedIn profile is an incredibly powerful tool but learning to optimize it the right way involves trial and error. You don’t have to spend tons of time figuring it out on your own… you can get a jumpstart TODAY! t’s a competitive world out there right now. You must stand out from the crowd! You are what you present and your LinkedIn profile is often times your first impression and digital introduction. Does it cast you in the best light? Simply copying and pasting your resume into your LinkedIn profile is not the answer! Why? Your LinkedIn profile is NOT your resume! Your resume is your professional history. Your LinkedIn profile is your career future! Your resume is dry, boring, and task-based. Your LinkedIn profile should be engaging and impressive to your reader. It should COMPEL them to pick up the phone and call you! And here’s the issue: Do you even know what makes a LinkedIn profile POWERFUL? How can you write your LinkedIn profile when you aren’t even sure how to make it look good? That’s where my book comes in! ith this fun and informative guide, you will learn how optimize your LinkedIn profile so you can get found on LinkedIn and align yourself with the right opportunities! And tons of examples to help you write your profile! ou’ll learn the very best practices for optimizing your LinkedIn profile without experimenting or spending hours and hours searching Google. I’ve spent five years making all of the mistakes, finding all of the tricks and becoming an expert with LinkedIn so you don’t have to. ou could spend your hard-earned evenings and weekends tinkering around with LinkedIn, reading endless blog posts about the best ways to leverage it and eventually figuring it out. Or, you could spend a couple of hours with my eBook and you’ll be off and running — optimizing your LinkedIn network the right way. 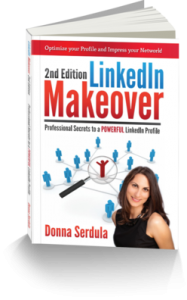 Click the button below to instantly grab your digital copy of LinkedIn Makeover: Professional Secrets to a POWERFUL LinkedIn Profile. Join the others who learned to harness the power of this incredible application in a couple of hours — not days or weeks. Get your Downloadable PDF Today!